ALLEGRA BOVERMAN/Staff photo. Gloucester Daily Times. Gloucester: For the third grade science unit on rocks and minerals and sediment at Veterans Memorial Elementary School, students are learning about how fossils are formed. 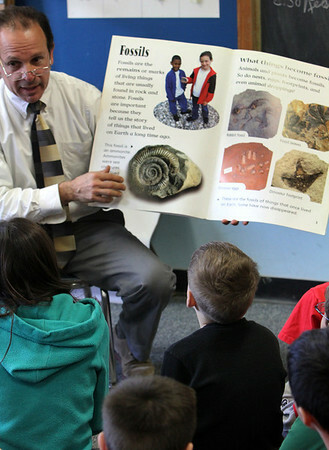 Teacher Steve Mirandi discusses fossils and geologic time with the students after they learned how to make their own fossils from educators from the Gloucester Maritime Center on Thursday afternoon.